What’s a self respecting sun worshiper to do? I’m FREEZING to death. Ok so perhaps that’s a tad bit dramatic, but still… it’s ridiculously cold and I hate it. 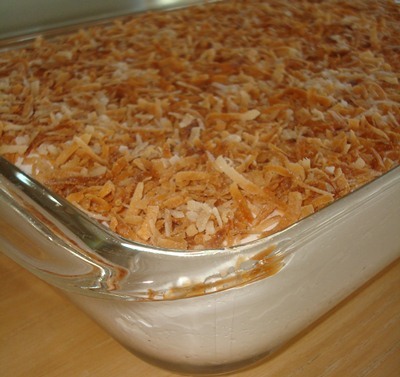 Thankfully I have the answer… and it comes in a glorious 9X13 Pyrex pan of coconutty goodness. Behold! My very own toasted coconut marshmallows… and because I love you all so much, the recipe. Soften 4 envelopes of gelatin in 3/4 cup cold water in your mixer. Give it a half hour or so before you start with the cooked mixture. Bust out your handy dandy candy thermometer (again… not optional) and clip it securely on the side of the pan. I’m not messing around when I say securely- I melted my flip flops to my foot once because I was being careless and the sugary molten lava spilled. Ouch and a half… oh and weeks wearing the same melted shoes because anything else bothered the blisters. Do not be careless making these, you will suffer as a result if you do. Cook the combined ingredients to 244*. Pay attention. Too low a temp will result with you having a ridiculous amount of marshmallow cream. Too long and they’ll be tough and chewy. Eww. Do not walk away and leave them, although it will feel like forever while you stand there, it happens in seconds when you’re not paying attention. Pour the lava into your mixing bowl and start slow, then build up (without a lava shower) to the highest speed on your mixer. Let it whip for 8-10 minutes. Oil a 9X13 Pyrex pan while you wait for them to blend (you can color them too if you want at this point). Dump the heavenly sticky goo into your pan and top with toasted coconut. Then wait. I- I wish I had two mouths right now so the mouth explosion was doubled. I wish everything could taste this good. She’s not exaggerating, they’re THAT good. Dust your entire life in powdered sugar and cut them with an oiled pizza wheel, being sure to dust each marshmallow on all sides or else your hard work will result in a giant disastrous marshmallow snake. Bag them up and enjoy. The smell of coconut wafting through the house is almost as good as smelling it on your skin after a day in the sun with tanning lotion. The taste is enough to transport you back in time to your favorite pina colada. They are divine. Make some, enjoy… and don’t forget to toast one. If you think you’ve had smores before? You haven’t until you’ve made them with a toasted coconut marshmallow. Mmmm. Yummy…. and let’s all look on the bright side, Punxsutawney Phil says an early spring is on the way! God love that strange little animal for not seeing his shadow. I made marshmallows successfully in my 14-cup food processor once! It can be done! Thanks! I have to make a batch of fondant for a cake Friday and I found a great recipe for marshmallow fondant, so I’m excited to give it a shot.